Before you start spraying your apples with insecticide, you should take a real assessment of where and how your tree is growing. If it was planted incorrectly or if the soil isn’t nutrient rich and holding the proper pH level, you probably want to start at the root of the problem. However, if it lives among its apple neighbors in a sunny locale and is still plagued by insects, there are an abundance of insecticides on the market from which to choose. 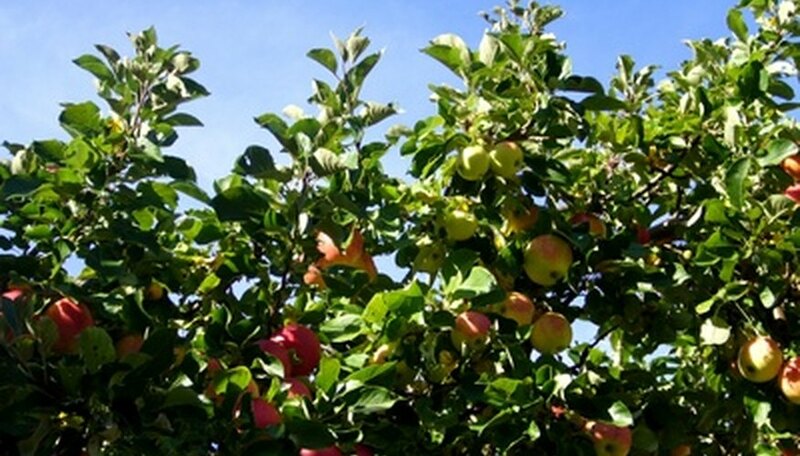 General-use insecticide imidacloprid is an effective aphid control insecticide for apple trees. Available in a variety of products at nurseries and greenhouses, it is applied by drenching the soil or spraying the foliage with an appropriate solution when aphid damage is first observed. The tree absorbs imidacloprid through its root system and pests feeding on the tree then ingest the poison along with the tree fluids. Cyfluthrin is used against a variety of infestations, including aphids, caterpillars, sawflies and weevils. Found in an array of pest products, cyfluthrin is a long-lasting insecticide that kills pests on contact or upon ingestion. Products containing cyfluthrin are applied directly to apple tree foliage as soon as damage or infestations are noticed. One of the most common and effective insecticides on the market is carbaryl. It is an effective tool against many insects, including the oystershell scale, which can kill an apple tree if left untreated. The carbaryl product should be sprayed on the tree after the scales have hatched. Chlorpyrifos is an effective, broad spectrum treatment for the flatheaded apple tree borer and other apple pests. It is commonly used on farms and in nurseries. Because it does not mix well with water, it comes in granules, or dustable and wettable powders or concentrates. Diflubenzeuron is a restricted-use pesticide generally applied in large-scale operations by aerial and land vehicles. Effective against insects including moths and parasites, diflubenzeuron can be used on apple orchards against the white-marked tussock caterpillar, a plant-damaging nuisance that can also spark allergic reactions in humans.